As the Pope’s FIAT pulled up to UN Headquarters last Friday, it slowed just a bit so that Francis could wave at a group of children dressed in white and sitting on the stairs of (ironically perhaps) the Trump Building. This was only the beginning of an outpouring of attention, enthusiasm and even yearning, the likes of which most of us have never seen at UN Headquarters. Many have written about the Papal visit to the UN. Twitter literally exploded with comments of all sorts, almost all of the ones I saw falling anywhere from cautiously positive to positively gushing. The newspapers proclaimed that “hope had come to New York.” (God knows we need it.) These reactions cannot be attributed to our embrace of celebrity or fame; neither are they a function of the rarity of papal visits. This outpouring of positive energy was more likely related to a long-suppressed search for meaning as well as for the encouragement to abandon cynicism and despair, to recalibrate our emotional depth, to provide a genuinely viable future for our children, not merely an education, an IPad, and an allowance. The Pope said some very helpful things from the podium in the UN General Assembly. He took up the challenges of healing our climate and eliminating our weapons of mass destruction. He spoke about us as biological beings that need to stop soiling the beds that we still need to lie on. He reminded us that no policy, regardless of its textual nobility or comprehensiveness, is likely to succeed unless we recover the practices of listening and caregiving, while committing in policy and practice to the pursuit of fairness and an end to inequalities. Whether one agrees or disagrees with Francis on the substance of issues, it was clear from his speech that he sees in those many souls clamoring to hear his words what most of the rest of us at the UN cannot. Francis was not trying to be clever or even strategic. He was not “purchasing the surfaces” of things nor was he caving in to political expediency. His words were largely measured, urgent, kind. But most important, it was clear that he is looking at the world and its people differently. His vision seems to penetrate deeper – deeper than our pretense and personal branding, deeper than our compromises and our rationales for each, deeper than our professional titles, entitlements and immunities. This ability to see differently is extraordinary and most worthy of emulation. And to my own eyes, the speech was not the only extraordinary aspect of the Papal visit. Watching Francis move from one responsibility to another inside the UN, navigating the crush of well-wishers including political dignitaries seeking a momentary ‘audience’: the press of flesh and the multiple distractions of noise and perpetual movement seemed overwhelming. Amidst the diplomatic chaos, Francis even made time to thank UN staff for their dedication and service, paying special attention to peacekeepers and members of UN country teams who lost their lives in the service of the institution, its values and constituents. In some important ways, this demeanor of Francis was even more telling than his words. If anything, the latter made the former more believable, more compelling. There is a lesson here for all of us. As our colleague Annie Herro reminds GAPW often, all of us at the UN are in one way or another “norm entrepreneurs.” As such the success of our work, perhaps ironically, has less to do about money and status and more to do with trust building and other character concerns – the ability to be where we say we’ll be, to resist unthoughtful policy solutions that are destined to unravel, to practice courage and kindness so that we can get better at both, to be willing to give to others what we expect from them in return, to communicate hope to persons and communities in ways that do not excessively raise expectations to levels that we know are unlikely to be fulfilled. Character issues are largely out of fashion, but they are not beyond relevance for good policy. At the UNGA on Friday, we had an example of someone whose demeanor prior to his UN speech – as well as the “depth” at which he routinely casts his gaze – gave added power to the words that eventually came out of his mouth. The “social fragmentation” to which Francis pointed with alarm is closely related to a fragmentation of personal character that manifests itself as a proclivity to “dispose” of things and people, as well as to horde what we should share and destroy what we cannot easily replace. These are some of the implications of our current policy and personal choices that Francis, by virtue of the quality of his living and his seeing, was particularly well placed to highlight. The hope displayed by Francis at the General Assembly podium is imperfect. It does not by itself resolve political differences and logistical challenges, nor does it guarantee that we will find the courage to turn away from our predatory and self-interested actions to save this planet – and ourselves along with it. But the thousands waiting for hours for a glimpse of the Pope in the Fiat, not to mention the many diplomats who rose to their feet to celebrate a man who presides over a faith often not their own, if these are any indication, then the hope of Francis is truly a hope we can believe in. 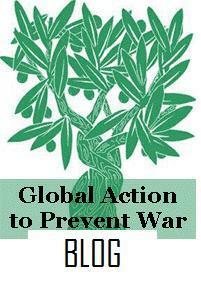 Like ‘Global Action to Prevent War’ on Facebook!